Westside Vancouver condo living you should own! Coming Soon! CambieStar Vancouver condos at King Edward Station is a stunning collection of new homes conveniently located in Cambie Village directly above the Canada Line King Edward Station and within walking distance to Westside neighbourhoods. Own it for its luxury design and quality finishes, its location and easy access to local transit routes. Live life on your own terms at CambieStar Vancouver Westside condos. The sales centre for Vancouver CambieStar condos is opening soon but please make sure you register online at www.cambiestar.com today for all the details. The project will be built to LEED Gold standards and is developed by award winning Yuanheng Developments. The convenient location at King Edward Station along the Canada SkyTrain Line with convenient transit services to the downtown area, Richmond and even UBC make CambieStar condos in Vancouver Westside an instant winner in our books! Plus, Cambie Star Vancouver condos are within walking distance to beautiful Queen Elizabeth Park and great shops, restaurants and cafes along Cambie Village. Many of the homes here will have great panoramic vistas out towards Queen Elizabeth Park and north to the North Shore mountains. The unique and modern architecture of Westside Vancouver Cambie Star condos is designed by award winning firm at W.T. Leung Architects and all homes are air conditioned and come with concrete construction, energy efficient double glazed windows and are protected by the comprehensive National Home Warranty. 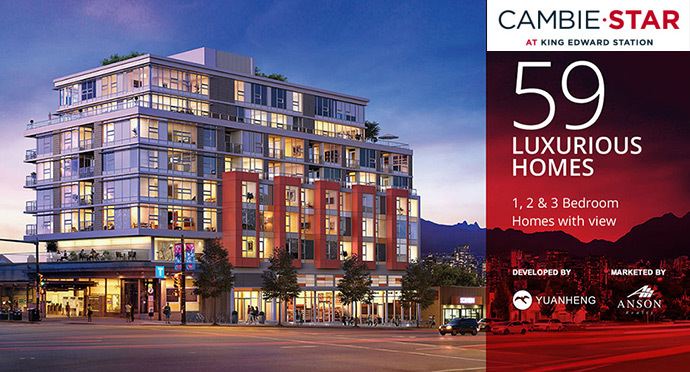 The sales centre location is at 3246 Cambie Street Vancouver and they are open daily between 12 noon and 5pm but closed on Fridays. You can also book a private appointment. If you are looking for additional information, please register on this page. As well, CambieStar Vancouver apartments will feature a fully equipped fitness gym on-site as well as a spacious entertainment lounge with a bar and kitchen for get-togethers with family and friends. There is underground parking, secured bike lockers as well as exclusive landscaped terraces. The homes at CambieStar Vancouver condos will feature incredibly designed open concept floor plans with views and the Dawn or Dusk colour schemes are hand selected by award winning firm Portico Design Group. 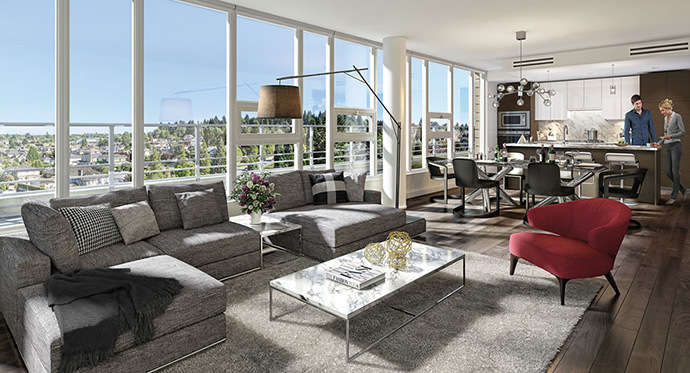 Cambie Star Condos will also feature high quality engineered wood floors in the kitchen, dining and living rooms in addition to plush and durable wool blend carpeting in all the bedrooms for the comfortable year round feeling. All homes will come with roller blinds on all windows in addition to GE Energy Star rated washer and dryer in a laundry closet. The designer ensuite and bathrooms at Cambie Star Vancouver condos includes luxurious marble counters and backsplash in ensuites as well as custom designed vanity mirror with floating shelf and medicine closet for storage. There are eco friendly dual flush toilets by Toto and frameless glass shower doors (in shower only bathrooms). Other bath features here at the luxury Vancouver CambieStar condos includes polished chrome accessories, Hytec Kohler skirted deep soaker tub and Kohler under mounted sink. The sink faucets are by Grohe along with the shower fixtures and the ensuite shower/tub surround tile is polished large formet porcelain tile. The cabinets are contemporary with horizontal grain wood veneer finish with chrome hardware for that modern look and feel. The chef inspired kitchens at the new Vancouver CambieStar Condos for sale includes a premium stainless steel appliance package by Fisher & Paykel that includes fully integrated double drawer dishwashers, sophisticated self cleaning wall ovens and a sleek gas cooktop. Other appliances include a fully integrated Liebherr fridge/freezer and fully integrated Panasonis microwave in select homes. The efficient under cabinet slide out Faber range hood finishes the appliances for your gourmet kitchen. Other features of note at the Vancouver Cambie Star condos includes convenient pantry storage in select floor plans, pendant lighting over the kitchen island, luxury hand crafted under mount Franke sink and Grohe faucet with pull out spray. The contemporary horizontal grain wood veneer cabinetry (like the bathrooms) will have stylish chrome hardware. Straight from their marketing as we couldn’t explain it any better! “After a long day, relaxation awaits. 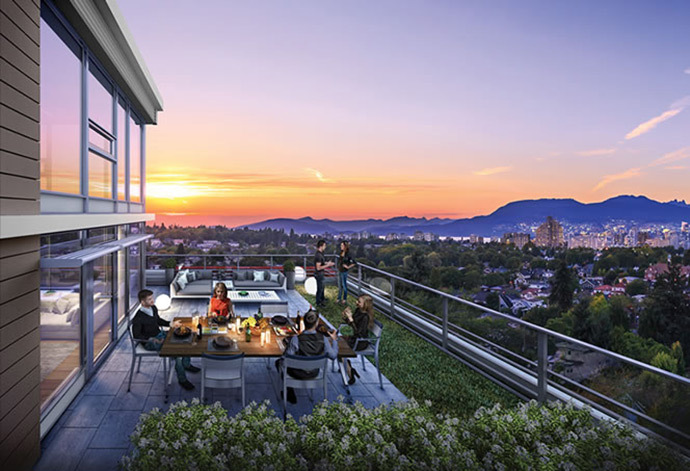 Start by savouring the spectacular views of Vancouver cityscape from either the privacy of your balcony or your own dazzling rooftop deck at CambieStar Vancouver condos. When you’re ready for a night on the town, let the Canada Line effortlessly whisk you away. With a station right at your front door, you’ll be in the heart of Vancouver’s arts and entertainment district in minutes – and no parking hassles. If you prefer two-wheeled travel, you’re literally surrounded by cycling routes. The Seawall and Science World, the shops and galleries of South Granville, delectable fresh produce from Granville Island, or people watching on Kits Beach – deciding where to explore first may be your toughest choice. Welcome home to Vancouver CambieStar Condos. A CELEBRATION OF DIVERSITY: Cambie Star, a stunning collection of homes conveniently located in Cambie Village, directly above the Canada Line King Edward Station and within walking distance to Westside neighborhoods. Explore the lively and distinctly community, cheer on the Vancouver Canadians at Nat Bailey Stadium, or ramp up your own fitness at Reilly Community Centre. Foodies have plenty to keep taste buds tingling. From Firewood Gourmet Pizza to romantic fine dining at Pied a Terre to casual beers with friends at BierCraft Bistro, everything’s walking distance and every day is a celebration of diversity. It really doesn’t get any better than Vancouver’s Cambie Star condos if you are looking for a brand new central and luxury home in this awesome city! Located at Cambie and King Edward Vancouver Westside CambieStar condo residences are coming soon! The signage is up and this prime Cambie Corridor site will feature an impeccable location that is just opposite the King Edward Station along the Canada SkyTrain Line which means that you will be connected to everything in the Lower Mainland. As well, you can easily walk to Queen Elizabeth Park and the shops of Cambie Village. The presale Vancouver Cambie Star condos will feature 1, 2, and 3 bedroom homes.